Born on January 2, 1953, Georg Williams grew up in Houma, an oilfield boomtown in the middle of the marshlands and swamps of southern Louisiana. As a kid, he always loved to draw. His dad, advising him that drawing was a waste of time unless you get paid for it, became his manager (receiving 90% of the profits). This gave young Georg a lot of practice in making people look good in portraits (and in how not to get involved with unscrupulous agents who also happen to be your father). He began selling his portraits at the tender age of 15. After a tour in the army, he spent a year roaming around the country doing odd jobs (when necessary) and avoiding any work when possible. Eventually finding himself back in the New Orleans area, Georg began pursuing a career as an artist. He studied art for an unreasonable amount of time at Nicholls State University. Afterward, he spent years un-learning what he was taught and learning about art for himself. As the owner of an art gallery in Houma, and later in New Orleans, Georg made a living selling other people's pictures, or framing them, and teaching art classes - where he stressed that art cannot be handed over by teachers but must be found by the students themselves. Growing tired of running a gallery, he began concentrating all his energies on raising his two daughters, and creating his own art. Which brings us to the present and cats and dogs. Georg changed his painting style from the photo realism of his commissioned portrait days back to the simpler, more caricatured style of his boyhood. He figured that getting a laugh from someone was a much better compliment than the "that's very interesting" or "it looks just like a photograph" he got from the patrons (critics) of his realistic art. After seeing animals in many of his paintings, a friend suggested to Georg that he should try painting dog and cat portraits - head and shoulder, like a passport or yearbook photo. 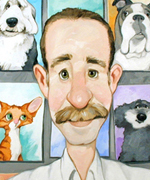 The pet portraits became so popular that he was forced to quit his job and sell his kids (just kidding) so he could paint full time. The kids, Kate and Sarah, are grown up now. They both inherited their father's talent and like him, neither one knows what to do with it. All three now live, work, and play in Austin, Texas.